This is the twenty-second in this series of 26 posts, one for each letter of the alphabet, that I am writing during the Blogging from A to Z Challenge, April 2016. You can find all the posts, as they are published throughout the month, by following the A-to-Z April 2016 tag. Many people never consider participating in a martial art because they see the actions performed in class as violent. Punching, striking, and kicking – even directed at the air or a heavy punching bag – don’t seem like things “nice people” do. Throwing people, pinning them with joint locks or holds seems distasteful. Some are so uncomfortable with being forceful or powerful in any way that they cannot bring themselves to give a ki-ai [KEY-eye], the loud shout you’ve come to know and love in martial arts films, or even say “NO!” or “Back off!” sharply. But avoiding learning to do powerful things doesn’t make one more kind, gentle, or loving, it just makes one incompetent. Similarly, developing skills that could be used in a violent way does not make one a violent person any more than knowing how to properly use an ax makes one an ax murderer. It is often said among martial artists that if one is incapable of causing harm, then not harming someone isn’t a pacifist choice made as a matter of principle or kindness, but is simply inability. When is violent action not violence? There are many ways of defining violence. One that comes to mind for many is using sudden, dramatic force. But that’s not the whole story. A neighbor who comes into your house and puts their fist through your wall could be seen as violent. But this is an incomplete picture. What if it’s your very strong, cat-loving neighbor, trying to help you rescue your kitten who got stuck inside the wall? That same action now seems more like a kind gesture. Certainly if you see a stranger standing around, and suddenly grab them by the lapels, yank them off their feet and hurl them to the ground, that’s violent, right? Well… What if they were about to be hit by a train, and you pulled them decisively out of the way? In that case, even if they were injured by your actions, no one would accuse you of having done something violent. To my way of thinking, violence is the product of force and malice. Causing (or attempting to cause) injury through hostility. Violence can even be verbal – insults, put-downs, or dismissals. Injury could be physical or emotional. What’s missing from that violence equation in Aikido, and in most martial arts, is malice. There is no ill intent toward our training partners. In class we are working together to help each other develop skills and discover new insights. We do not intend to harm each other. Even out in the world, among strangers, Aikido is not meant for getting into fights and hurting others – even someone who attacks us. Like many other martial arts, Aikido is meant to be used primarily as a practice for self development, and can also be used for protecting one’s self and others from harm. A very big part of the self development available in Aikido practice is learning to control our own violent impulses. We practice remaining calm and present, even when we are being threatened. When doing techniques, we practice exercising care and restraint. Through both the physical and philosophical sides of our practice we learn to let go of the malice we might be naturally inclined to feel toward our attacker, and to protect them from harm as well. 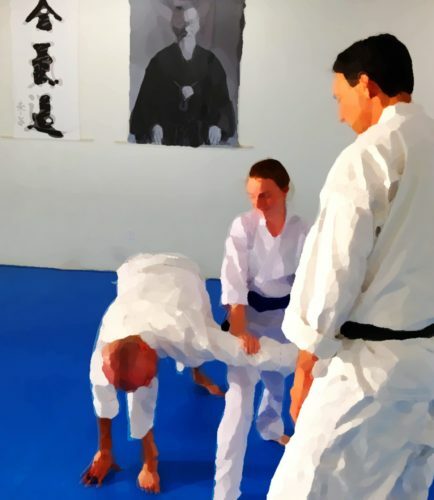 Whether you are so strongly committed to non-violence that you are afraid of your own power, or whether you resort easily and automatically to using force or intimidation to resolve conflicts, I suggest that training in Aikido will benefit you. It’s only when can access a full spectrum of responses to a perceived threat that you can freely choose the most appropriate course of action to deal with it. From Aikido to Zanshin - 26 Essays on the Martial Art of Peace. This series will soon be available as a book, both in print and for Kindle, too! From Aikido to Zanshin is for anyone with even a casual interest in Aikido. I invite you to read and share with friends. Aikido – It’s a Lot Like… Handwriting? Wish you could do martial arts, dance, hiking, kayaking, or whatever, but don't feel ready? I offer fitness coaching, programs, and classes in San Diego and East County for people who want to get moving and keep moving on the path to a more fun, healthy, active life. Need some help fine-tuning your dojo's or gym's messaging? Wondering how to improve your website? Is social media a mystery? Need a professional-looking event flyer? I can help! I have worked for years in technical communication, software/app design, and user experience analysis. Hourly consulting available, or I can quote your project. I train at Aikido of San Diego, under Dave Goldberg Sensei, 5th Dan. In the San Diego area? If you're thinking about trying Aikido, please come visit the dojo and see a class or two for yourself. If you already train, you're welcome to drop in for a small daily mat fee. We are a well-established Aikido dojo, with experienced instructors and friendly, vibrant community of dojo members. All content copyright © 2009-2019, Linda Eskin. Want to reprint or translate short excerpts of my work? That's great! I will almost certainly support you in doing that, with proper attribution. Please request written permission first. I built this website on the Wordpress platform, using the GeneratePress theme. Many thanks to the creators of both!